The Healthy Hoof app takes the hassle out of recording your lame cows. Prevention of lameness is critical to the welfare of your cows and to your bottom line. To reduce the lameness in your herd, you must first understand the nature and scale of the problem and this is where the Healthy Hoof app comes in, allowing you to easily record lameness information. You can then use this information to identify and address the potential risk factors, assisting you to move your focus from treating lameness to preventing it - saving you time and money and your cows from the associated pain and discomfort. You don't need to be a lameness expert. The Healthy Hoof app steps you through, from scoring to treatment. Detect lameness early on your farm by lameness scoring your cows. This tool is great for estimating the proportion of lame cows in your herd. If you vet is scoring the herd, they can use the app too. If you're getting the cows in and notice a lame cow, tap on the app and flag her for treatment later. You don't have to be a vet to identify and treat lameness. 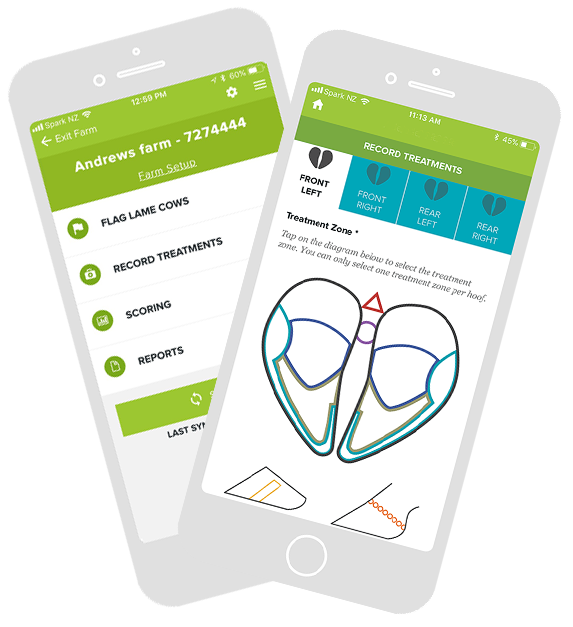 The 'treatments' section of the app allows you to select the point of pain on the hoof that needs treating, and the app will indicate the type of lameness. Treatments are recorded, so you can track the treatment history for the cow and any herd trends. Data can easily be exported to your computer, so you can talk about the reports with a Healthy Hoof advisor, veterinarian or hoof care specialist. The information you collect is synced to a cloud-based database. By entering data into the app, your are helping us build a national lameness dataset. This info will help us establish sector benchmarks for lameness in New Zealand. Don't worry, your data will not be tracked to your farm or shared with anyone. The much anticipated Healthy Hoof app is now available - check out our quick guide here. The Healthy Hoof Programme focuses on prevention of lameness with information and training on management and treatment. Find out more about the tools available for preventing and treating lameness in your herd.